Cities: Capital: San Jose (greater metropolitan area pop. 2.1 million, the greater metropolitan area as defined by the Ministry of Planning and Economic Policy includes the cities of Alajuela, Cartago, and Heredia). Other major cities outside the San Jose capital area — Puntarenas, Limon, and Liberia. Nationality: Noun and adjective — Costa Rican(s). Education: Years compulsory: 9. Attendance — 99% grades 1-6; 71% grades 7-9. Literacy — 96%. Health: Infant mortality rate (2011 est.) — 9.45/1,000. Life expectancy (2011 est.) — men 75.1 years, women 80.46 years. Work force (2010 est. ): 2.05 million; this official estimate excludes Nicaraguans living in Costa Rica legally and illegally. Branches: Executive: president (head of government and chief of state) elected for one 4-year term, two vice presidents, Cabinet (22 ministers, two of whom are also vice presidents). Legislative — 57-deputy unicameral Legislative Assembly elected at 4-year intervals. Judicial — Supreme Court of Justice (22 magistrates elected by Legislative Assembly for renewable 8-year terms). The offices of the Ombudsman, Comptroller General, and Procurator General assert autonomous oversight of the government. GDP (2010 est., official exchange rate): $35.78 billion. GDP (2010 est., purchasing power parity): $51.17 billion. Real growth rate (2010 est. ): 4.2%. Per capita income (2010 est., PPP): $11,300. Inflation rate (2010 est. ): 5.7%. Agriculture (6.5% of GDP, 2010 est. ): Products — bananas, pineapples, coffee, beef, sugar, rice, dairy products, vegetables, fruits, ornamental plants, corn, beans, potatoes, timber. Industry (22.5% of GDP, 2010 est. ): Types — electronic components, medical equipment, textiles and apparel, tires, food processing, construction materials, fertilizer, plastic products. Commerce, tourism, and services (71% of GDP, 2010 est. ): Hotels, restaurants, tourist services, banks, and insurance. Trade (2010 est. ): Exports: $9.375 billion: integrated circuits, medical equipment, bananas, pineapples, coffee, melons, ornamental plants, sugar, textiles, electronic components. Major markets (2009) — U.S. 35.9%, China 8.8%, Netherlands 6.8%, Panama 4.6%. Imports — $13.32 billion: raw materials, consumer goods, capital equipment, petroleum. Major suppliers (2009) — U.S. 42.1%, Mexico 6.5%, China 6.2%, Japan 5.3%. Unlike many of their Central American neighbors, present-day Costa Ricans are largely of European rather than mestizo descent; Spain was the primary country of origin. However, an estimated 10% to 15% of the population is Nicaraguan, of fairly recent arrival and primarily of mestizo origin. Descendants of 19th-century Jamaican immigrant workers constitute an English-speaking minority, about 3% of the population. Few of the native Indians survived European contact; the indigenous population today is less than 1% of the population. In 1502, on his fourth and last voyage to the New World, Christopher Columbus made the first European landfall in the area. 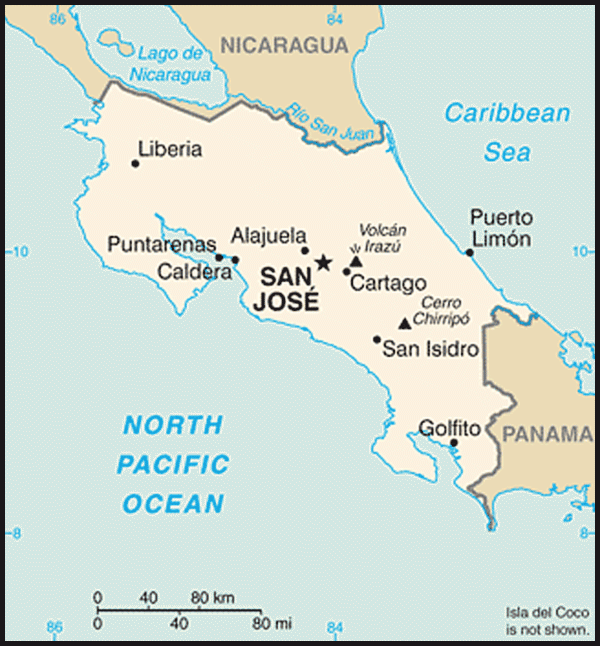 Settlement of Costa Rica began in 1522. For nearly 3 centuries, Spain administered the region as part of the Captaincy General of Guatemala under a military governor. The Spanish optimistically called the country "Rich Coast." Finding little gold or other valuable minerals in Costa Rica, however, the Spanish turned to agriculture. An era of peaceful democracy in Costa Rica began in 1899 with elections considered the first truly free and honest ones in the country's history. This began a trend that continued until today with only two lapses: in 1917-19, Federico Tinoco ruled as a dictator, and, in 1948, Jose Figueres led an armed uprising in the wake of a disputed presidential election. With more than 2,000 dead, the 44-day civil war resulting from this uprising was the bloodiest event in 20th-century Costa Rican history, but the victorious junta drafted a constitution guaranteeing free elections with universal suffrage and the abolition of the military. In 1949, Costa Rica dissolved its armed forces and Figueres became a national hero. He won the first election under the new constitution in 1953. Since then, Costa Rica has held 15 presidential elections, the latest in 2010. The electoral process is supervised by an independent Supreme Electoral Tribunal — a commission of three principal magistrates and six alternates selected by the Supreme Court of Justice. The last national elections took place in February 2010. Judicial power is exercised by the Supreme Court of Justice, composed of 22 magistrates selected for renewable 8-year terms by the Legislative Assembly, and subsidiary courts. A Constitutional Chamber of the Supreme Court (Sala IV), established in 1989, reviews the constitutionality of legislation and executive decrees and all habeas corpus warrants. Costa Rica maintains an embassy (http://www.costarica-embassy.org/?q=node/21) in the United States at 2114 S Street NW, Washington, DC 20008 (tel. 202-234-2945 and 202-234-2946). On May 8, 2010 Laura Chinchilla, of the National Liberation Party (PLN), was sworn in as President of the Republic of Costa Rica. Chinchilla's top priority is strengthening security, and she is likely to push for fiscal reform to support her policies, seeking to boost revenue, possibly through revised tax legislation, to fund an increase in security services and education. Chinchilla is also focused on improving the country's infrastructure, reforming taxes, expanding jobs through a "green jobs" initiative, creating better living conditions for children and senior citizens, and supporting women's issues. Following the 2010 elections, the 57-member unicameral Legislative Assembly fragmented into several parties, with no faction having a plurality — the PLN won 23 seats, the PAC 12 seats, PML 9 seats, and the PUSC 6 seats, with the remaining seats split among lesser known parties. After experiencing positive growth over the previous several years, the Costa Rican economy shrank slightly in 2009 (-2.5%) due to the global economic crisis. The services sector was the most affected, with tourism falling by 8%. Services account for about 71% of GDP. The economy experienced a rebound in 2010 with a 4.2% GDP growth rate. Costa Rica enjoys the region's highest standard of living, with a per capita income of about U.S. $11,300. The unemployment rate is 7.3%. Consumer price inflation is high but relatively constant at about a 10% annual rate in the last decade. Costa Rica's major economic resources are its fertile land and frequent rainfall, its well-educated population, and its location in the Central American isthmus, which provides easy access to North and South American markets and direct ocean access to the European and Asian continents. Costa Rica is known worldwide for its conservation efforts with more than 26% of its land under protection, thus safeguarding more than 5% of the entire world's biodiversity. The country's top economic priorities include passing fiscal reform, pursuing responsible monetary policy, and creating opportunities for inclusive economic growth. Significant legislative hurdles slow down passage of new laws and present challenges for the country's economic policymakers. Costa Rica's insurance, telecommunications, electricity distribution, petroleum distribution, potable water, sewage, and railroad transportation industries have been state monopolies. However, under the U.S.-Central American-Dominican Republic Free Trade Agreement (CAFTA-DR), Costa Rica accords substantial market access in a wide range of services, subject to very few exceptions. The wireless telephony, data telecommunications, and insurance markets opened to market competition in 2010. As part of the implementing agenda for CAFTA-DR, Costa Rica intends to strengthen and modernize the state monopoly telecommunications provider (ICE) so that it can remain competitive with new companies entering the market. Costa Rica used to be known principally as a producer of bananas and coffee, but pineapples have surpassed coffee as the number two agricultural export. Manufacturing and industry's contribution to GDP overtook agriculture in the 1990s, led by foreign investment in Costa Rica's free trade zone. Well over half of that investment has come from the United States. Del Monte, Dole, and Chiquita have a large presence in the banana and pineapple industries. 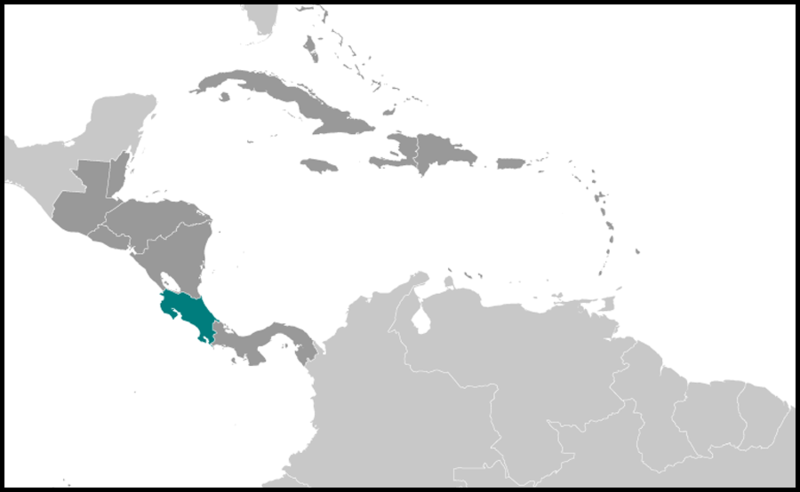 In recent years, Costa Rica has successfully attracted important investments by such companies as Intel Corporation, which employs 3,200 people at its $1.996 billion microprocessor plant; Procter and Gamble, which employs about 1,200 people in its administrative center for the Western Hemisphere; and Boston Scientific, Allergan, Hospira, and Baxter Healthcare from the healthcare products industry. Two-way trade between the U.S. and Costa Rica exceeded $10.3 billion in 2010. Costa Rica was the United States' 37th-largest goods export market in 2009. Costa Rica has sought to widen its economic and trade ties within and outside the region. The country signed a bilateral trade agreement with Mexico in 1994, which was later amended to cover a wider range of products. Costa Rica also has signed trade agreements with Canada, Chile, the Dominican Republic, Panama, and several Caribbean Community countries. In March 1998, it joined other Central American countries and the Dominican Republic in establishing a Trade and Investment Council with the United States. Following a 2007 public referendum, Costa Rica ratified CAFTA-DR, which entered into force in January 2009. The country was an active participant in the negotiation of the hemispheric Free Trade Area of the Americas and is active in the Cairns Group, which is pursuing global agricultural trade liberalization within the World Trade Organization. In October 2007, Costa Rica began negotiating a regional Central American-European Union (EU) trade agreement. Together with El Salvador, Guatemala, Honduras, Nicaragua, and Panama, its free trade agreement with the EU came into force in January 2011. In April 2010 Costa Rica signed free trade agreements with China and Singapore. Additionally, Costa Rica is interested in joining the Asia-Pacific Economic Cooperation (APEC) forum and the Organization of the Petroleum Exporting Countries (OPEC). Costa Rica is an active member of the international community and proclaimed its permanent neutrality in 1993. Its record on the environment and human rights and advocacy of peaceful settlement of disputes give it a weight in world affairs far beyond its size. The country lobbied aggressively for the establishment of the UN High Commissioner for Human Rights and became the first nation to recognize the jurisdiction of the Inter-American Human Rights Court, based in San Jose. Costa Rica has been a strong proponent of regional arms limitation agreements. In 2009, Costa Rica finished its third term as a non-permanent member of the United Nations Security Council. During the tumultuous 1980s, then-President Oscar Arias authored a regional peace plan that served as the basis for the Esquipulas Peace Agreement. Arias' efforts earned him the 1987 Nobel Peace Prize. Subsequent agreements, supported by the United States, led to the Nicaraguan election of 1990 and the end of civil war in Nicaragua. Costa Rica also hosted several rounds of negotiations between the Salvadoran Government and the Farabundo Marti National Liberation Front (FMLN), aiding El Salvador's efforts to emerge from civil war and culminating in that country's 1994 free and fair elections. In 2007 Costa Rica established diplomatic ties with China, ending nearly 60 years of diplomatic relations with Taiwan. In 2008, Costa Rica established diplomatic relations with "The State of Palestine," and in 2009 Costa Rica reopened formal relations with Cuba. In 2009, then-President Arias acted as mediator in the Honduran constitutional crisis, working closely with ousted President Manuel Zelaya and the interim Honduran government. Costa Rica formally recognized Porfirio "Pepe" Lobo as the winner of the 2009 Honduran elections and the President of Honduras. Costa Rica and Nicaragua have disputed issues related to their border for over a century. The latest flare-up began in October 2010 when Costa Rica claimed that, as part of an ongoing dredging operation, Nicaraguan troops crossed the Rio San Juan into Costa Rican territory. In March 2011, the International Court of Justice (ICJ) ruled on the provisional measures (similar to an injunction) requested by Costa Rica in its territorial dispute with Nicaragua. The Court's final ruling on the dispute may take several years. Tensions between the two countries have eased somewhat. The United States and Costa Rica have a history of close and friendly relations based on respect for democratic government, human freedoms, free trade, and other shared values. The country generally supports the U.S. in international fora, especially in the areas of democracy and human rights. The United States is Costa Rica's most important trading partner. The U.S. accounts for almost half of Costa Rica's exports, imports, and tourism, and more than two-thirds of its foreign investment. The two countries share growing concern about the environment and want to preserve Costa Rica's important tropical resources and prevent environmental degradation. In October 2010, the U.S. and Costa Rican Governments, the Central Bank of Costa Rica, and The Nature Conservancy concluded agreements that will provide more than $27 million over 15 years for tropical forest conservation in Costa Rica, one of the most biologically diverse countries on earth. The agreements were made possible by the Tropical Forest Conservation Act of 1998 (TFCA). Together with a previous TFCA program established in 2007, these agreements make Costa Rica the largest beneficiary under the TFCA, with more than $50 million generated for the conservation, restoration, and protection of tropical forests. The United States responded to Costa Rica's economic needs in the 1980s with significant economic and development assistance programs. Through provision of more than $1.1 billion in assistance, the U.S. Agency for International Development (USAID) supported Costa Rican efforts to stabilize its economy and broaden and accelerate economic growth through policy reforms and trade liberalization. Assistance initiatives in the 1990s concentrated on democratic policies, modernizing the administration of justice, and sustainable development. Once the country had graduated from most forms of U.S. assistance, the USAID Mission in Costa Rica closed in 1996. However, USAID completed a $9 million project in 2000-2001 to support refugees of Hurricane Mitch residing in Costa Rica. Additionally, Costa Rica benefits from regional USAID development programs. For decades, Peace Corps volunteers have provided technical assistance in the areas of environmental education, natural resources, management, small business development, microfinance, basic business education, urban youth, and community education. In 2007, the Costa Rica Multilingue initiative approached the Peace Corps with a request for a new project focused on teaching English as a foreign language (TEFL). The first group of 25 Peace Corp trainees under the TEFL project arrived in October 2010. Over 50,000 private American citizens, including many retirees, reside in the country and more than 700,000 American citizens visit Costa Rica annually. A few vexing expropriation and U.S. citizen investment disputes have hurt Costa Rica's investment climate and have occasionally produced bilateral friction. The U.S.-Costa Rica Maritime Cooperation Agreement, the first of its kind in Central America, entered into force in late 1999. The agreement, which facilitates cooperation between the Coast Guard of Costa Rica and the U.S. Coast Guard, has resulted in a growing number of narcotics seizures, illegal migrant rescues, illegal fishing seizures, and search-and-rescue missions. Bilateral Costa Rican law enforcement cooperation, particularly against narcotrafficking, has been exemplary. The U.S. Embassy (http://costarica.usembassy.gov/) in Costa Rica is located in Pavas at Boulevard Pavas and Calle 120, San Jose, tel. (506) 519-2000 or (506) 220-3127.